These unique, beautiful pendants make the perfect gift or special memento. 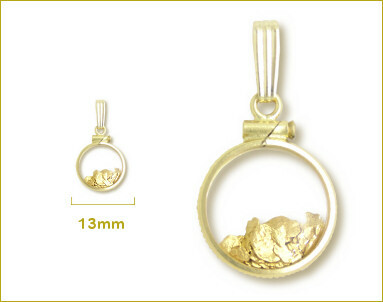 As found, natural alluvial gold flakes, just as if you had panned them yourself, from the West Coast of New Zealand, sit loosely inside two lenses and have a solid 14kt gold pendant surround and bail loop. Complement these stunning pendants with their matching earrings or a chain.